Did you know that there is an obituary of sorts for shopping malls? Seriously! The site is simply called www.DeadMalls.com! Who would have thought it would come to that? The only reason I know this is that I happened to be looking through some old photos that I found in a drawer and found one that was taken at Eastland Mall in North Versailles. 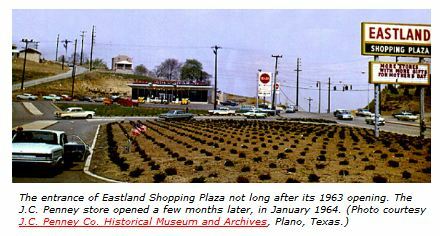 Eastland Shopping Plaza opened its doors for the first time on August 15, 1963. I remember going to Eastland with my mother and my Aunt Mary, and how they marveled at the size, the convenience and how much better it was than walking through downtown McKeesport. Unfortunately, many other people thought the same thing, and as a result, McKeesport’s business fell off dramatically. So many of the stores in Duquesne had closed or were about to close since the “redevelopment” had recently begun. First Street was less than a year from being razed, so residents were beginning to form new shopping habits. As much as Mom liked Eastland Shopping Plaza, old habits were hard to break and she continued to frequent Sally Fashions and Salkowitz Dress Shop in Duquesne for her “preferred wardrobe.” She also continued to shop at Adler-Greens for my dad, brother and I. When it came to items for the house, it was always the Golden Rule, Helmsteaders and Hirshbergs in McKeesport. In 1964 when all of North First Street fell victim to the redevelopment’s bulldozer, so did my father’s business on South First Street. It was a VERY stressful and traumatic time for our family. My dad was devastated about closing his business without a choice in the matter. He had just turned 49 years of age and was forced to begin a new job. Fortunately, he was such an adept mechanic, he found work easily at the J C Penney Auto Center in Eastland Shopping Plaza. He was promoted to Service Manager and continued in that role until his retirement in 1980. So, for 16 years, Eastland was a part of our lives. I knew it well. In its heyday, Eastland Mall was a two-level, shopping plaza that was built on 57 acres of land at the peak of a hill overlooking the Monongahela River. There was an urban legend about the land that it was built on. Supposedly, the area was once a huge slag dump for the surrounding McKeesport steel mills. Duquesne Works had its own site to dump stag, so were not part of the legend. Every so often, someone would resurface the theory that the mall, in its entirety, would one day slip over the hill toward the Monongahela River due to its unstable foundation of shifting slag. That fate never materialized, and the mall suffered its own gradual and painful death on February 15, 2005, after 42 years. Originally, Eastland Shopping Plaza was home to 4 department Stores and 52 other retail businesses. Eastland opened with stores such as Gimbels, Sears, J.C. Penneys, Wander Sales, F.W. Woolworth, May-Stern, McSorley’s Restaurant, Docktor Pet Center, Thom McAn (I always thought that was a strange spelling.) There was a Young Men’s store named Silberman’s, Kinny Shoes, and a Richard’s Shoes. Immel’s had a location at Eastland along with National Record Mart. NRM was on the lower enclosed level of the mall along with a toy store that I can’t remember the name of. Was it Kay Bee? There was also a shoe repair on that level, Valley Shoe Repair that remained there from the first day Eastland opened in 1963 until the mall closed in 2005. That distinction was shared with only one other business, Marc Anthony’s Hair Salon. In the winter of 1969, I turned 18 and was old enough to begin working at Eastland. At that time, it was still an open air shopping plaza. I decided not to go the route of nepotism and apply at J C Penneys, but took a leap and applied at Gimbels. To my surprise (as well as my dad’s), I managed to get hired on as a holiday seasonal! I was quite excited about working at Gimbels. It was always considered an upscale store and I enjoyed the excitement. Little did I know that the retail “bug” would bite me and cause me to continue into a retail career that lasted until 2007! I recall how festive Gimbels and the mall looked at holiday time. The amount of customers during the holiday season was astounding. People came from all over the area to Eastland. I saw so many people that I knew from Duquesne while working there. Even some personalities made their way to the mall as well. I had the pleasure of waiting on Donna Jean Young during the holidays which was very exciting. Perhaps the most famous person I met was Hugh Geyer, lead singer for the Vogues. At that time, they were one of the most popular groups in the United States. I remained at Gimbels while I was in college until 1971. 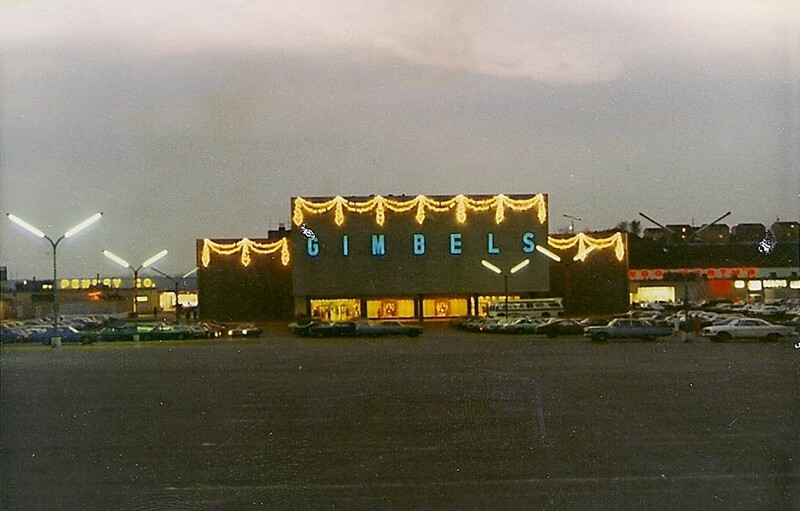 When I left Gimbels after graduation, the store was feeling the bite of competition from Monroeville Mall which had opened in 1969. I remember the Eastland Mall Theatres that were tucked away in the far corner of the Shopping Plaza. They opened at the same time the shopping plaza opened. There were two screens. I remember that the entrance was very bright and was primarily white and gold and aqua(?)! I recall taking dates there, but only remember seeing one movie. What does that say about my dates?? The only movie I remember was Funny Girl in 1969. 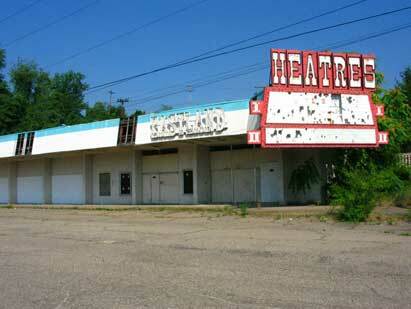 For a short time, I worked at the Eastland Car Wash which was located to the right of the theatre. I worked there for about 6 months during the fall and winter. The conditions were crappy since we all were freezing most of the time. I would either be sloshing water on hubcaps at the start of the wash or be part of the detail crew at the end of the wash. Either chore had me exposed to the weather for the most part. As would be expected, it was a rather “motley” crew that worked at the car wash. That’s where I learned all my bad habits as a means of survival. Instead of learning the 3 R’s as in school, I learned the 3 S’s. Swearing – Spitting – Smoking. I dressed like a bum, was as dirty as a pig and smelled like one too. But boy, we all had fun there! The car wash was destroyed by a fire in 1987. A few years after I moved away from home, there was a fire at Eastland. It occurred on June 6, 1973 during the morning hours. It apparently started either at a dairy store or bakery that was located in the lower level mall. 27 stores were involved, 20 in the lower level and 7 on the upper level. 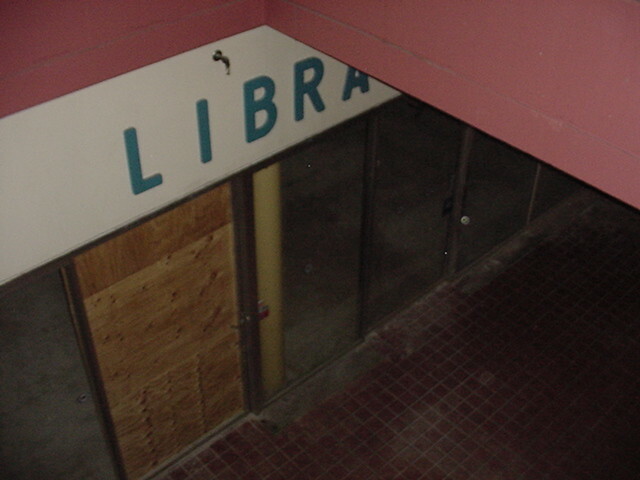 Renovation had already been underway to enclose the upper area of the mall at the time of the fire. What eventually emerged from the renovations and restorations following the fire was an enclosed mall with a new “big box” store, Gee Bee, anchoring one end of the complex. The name changed from Eastland Shopping Plaza to Eastland Mall after the mall was enclosed. After graduation from college in 1972, Eastland Mall and I parted ways. I entered into my “wanderlust” years and began a series of moves that were career associated. I remember returning to the area in 1977 and visiting Eastland with my then fiancée Judy. I recall taking the escalator in Gimbels to the 2nd floor and buying here a bisque musical nativity of the Holy Family. I believe that was my last visit to Eastland many, many years. As I indicated earlier, my father continued to work at Penney’s Auto Center until his retirement 1980. As I continued to travel and relocate to different parts of the country, Dad and my Aunt Mary would keep me abreast of what was happ ening to Eastland. Century III Mall in West Mifflin had opened in 1979 and between that new competition and the continued success of Monroeville Mall, Eastland had suffered a huge decline in business. That decline continued in subsequent years and culminated in 1986 when Gimbels went out of business and closed their doors at Eastland. With that final blow, most of the mall’s remaining tenants left. The next time I visited what WAS Eastland Mall, things had changed quite dramatically. Stretched across the once pristine façade that was graced with the name of Gimbels, was a stark white sign that boasted “New Eastland.” In the corner of the parking lot was a boarded-up Penney’s Auto Center, once my dad’s bread and butter. Pathetically standing in the opposite corner of the parking area was the remnants of the Eastland Mall Theatres. I entered the front doors of what was a classically beautiful Gimbels and felt a little like George Bailey from “It’s A Wonderful Life” stepping into “Nick’s” the neighborhood bar that used to be “Martini’s.” Nothing was the same. In place of the sparkling aisles and well displayed departments was a maze of mismatched tables, recycled display racks. The noise was at a deafening level and the chaos was even more intense. The 2nd floor had been closed off by boarding up the escalator, but the lower level was still open and duplicated the scenario from the first floor. Believe me, I am a huge fan of flea markets and garage sales. I think they are a blast! However, the scene I encountered that day was a bit upsetting to me. I had seen the demise of the heart of Duquesne, and now to see yet another place I loved suffer the same fate was a bit disconcerting. 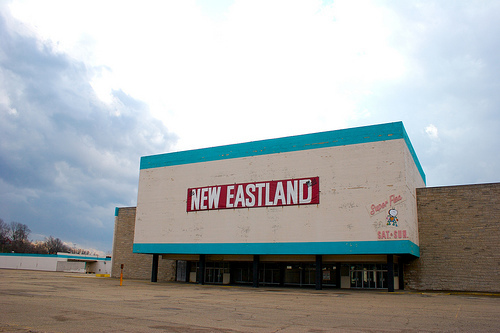 In 2005, “New Eastland” became “No Eastland” when the entire site was razed. Eastland’s obituary has been written-up on several different sites on the internet. The following is from Wikipedia. Eastland was a grand old lady! Eastland was located primarily around old mill towns. Many of these communities lost vast amounts of population during the lifetime of the Eastland Mall. Braddock, which East Pittsburgh-McKeesport Blvd leads directly into two miles (3 km) away, had approximately 12,000 residents in 1963. By the mall’s close in 2005 it had fewer than 3,000. This demographic change took with it, potential customers and employees of Eastland Mall. After Eastland Mall had already filed for Chapter 11 bankruptcy, its most devastating blow came in September 1986 when Gimbels, which had developed and owned the mall, went out of business, taking most of Eastland’s tenants along with it. 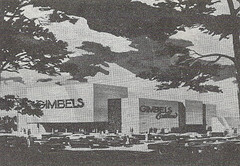 Benderson Development Company of Buffalo, NY purchased the mall from the bankrupt Gimbels department store two years later. For the next 20 years Eastland tried to stay afloat with a variety of unique tenants – including a PennDOT state driver’s license testing center, a beer distributor (Beer World, located in the old J.C. Penney’s), a distribution center for Xerox, the local magistrate’s office, a professional wrestling center (PWX, owned by James Miller), a bingo parlor (Eastland Social Hall Bingo), and a low power TV station, WBYD-CA. Most notable was the addition of a two story indoor and spacious outdoor flea market in the space once occupied by Gimbels which, according to a flea market manager, drew 500 vendors and 2,000 customers per weekend at its peak. Many smaller retail stores then opened inside the mall, including Harper’s Bazaar (a mom-and-pop women’s clothing store run by Jim and Carol Harper), Kennywood Messenger Service (a notary and vehicle licensing service), Amer-a-Quick printing service, a barber shop, and a beauty parlor. The revival was temporary. 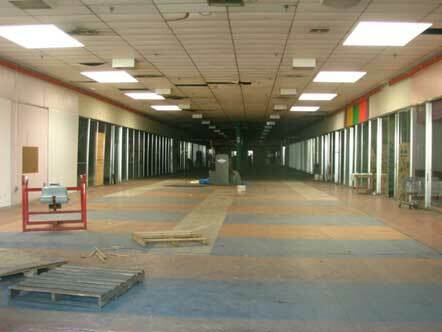 In the 1990s, the flea market was moved off to the side in the old Gee Bee store, taking foot traffic away from the retail stores located inside the mall. The building then fell into a state of ruin. By the time the mall closed in 2005, it was only worth $1.38 million – less than the $1.4 million that Benderson Development Company paid for it 1988. By that point, trash cans holding water falling from the leaky roof abounded throughout the mall. Parts of the original Gimbels facade had collapsed and the walls were showing stress cracks. The walkway was no longer heated and the tiles were so broken and floor so uneven the heels of a shopper’s shoes often caught in the floor. This entry was posted in Food and Restaurants, McKeesport, Stores and Businesses. Bookmark the permalink. I worked at Gimbels Eastland men’s department from 1976 to 1978. The three full-time guys and one part-time I worked with told me of how Monroeville Mall had taken a lot of business and how some of the employees had transferred there when it opened in 1969. Fortunately, Eastland was still busy enough that we made a good living for what was considered that for the time. We really had a ball and got along better than any other group of people I have ever worked with. And that includes the many women that worked around us in the men’s shirt, ties, shoes, and accessories areas. We frequented McSorley’s Restaurant for lunch and supper. We closed it many a night. I left before Century III added another major blow to the declining traffic. Interesting, that just recent news has stated that Century III is now succumbing to the same fate as Eastland did. I was just talking about my favorite desert. It was a frozen pecan ball at McSorleys restaurant at Eastland!! Thanks for all of the info-moved to Ohio in 86. Besides Eastland, I recall a shopping center up on Rt 30 that bordered the DriveIn. We used to go there back in the 70s when they would hold a flea market. Besides the typical stuff you’d see, I recall the guy that used to sell hubcaps (he had ton’s of them). Just a good memory from a simpler time. Thanks for sharing yours! That was Greater Valley Shopping Center. My uncle used to take us there for the flea market every Sunday. The shopping center still exists but of course it has really changed. Those were the days when a flea market was a really good flea market. Do you remember the Ponderosa that was across the street and down the hill? That was the fancy restaurant in town back then. The hubcap guy was my grandfather. Adam was his name. My dad, me, and my brother would help him load them back up into his truck. You had to pack them in the barrels he had just right or you’d never even be close to getting them all in. My mother worked at Sun Drugs at Eastland years before I was born. Growing up she always took us to Eastland. I loved the small toy section in Gimbels. I got a HUGE teddy bear from that department back in the 70’s. We shopped at JC Penney there a lot. I remember Gee Bees and getting our school supplies there. They were so tough on shoplifters because they would have someone at a podium at the entrance to staple your open bags. The mall was in a rough neighborhood and we watched Eastland fall apart before our eyes. Weiner World had the best hot dogs ever. Years after Gimbels closed I would go to Beer World and get my hair cut there. I have a memory of our car getting worked on at the auto shop near Penney’s and the TV show “Fish” was on the TV. My dad bought me an Atari cartridge at the Penney’s there once. We always parked near Penney’s and Gee Bees. As a kid, I was always fascinated with the view off the back of the mall. As someone already posted, I too got to see “Bigfoot” in ice at the mall. My mother said we were all ripped off. I think it was like $5 or something. Does anyone remember a pizza place across from the mall that let you keep the pizza pan. It was around 1976. How about the pet store on 5th Ave in East McKeesport that had a real lion in a cage. We would stop in on our way home from the mall. The memories go on and on. Calling the neighborhood “rough” is inaccurate and insulting. The immediate area is called Green Valley. It was a wonderful part of North Versailles and growing up there was almost idyllic. We even have a Facebook page about growing up there. True, as the mills and Westinghouse closed, the area declined economically but the people who lived there were hard working, helpful, fun, energetic people who supported each other, their churches, schools, police, volunteer fire department, and their country. I am from the area and not insulting anyone. My dad was from Homestead and my mother from McKeesport. I know the area well. I am simply pointing out my perspective and my opinion. I remember when Eastland theater was so nice but then it started to get destroyed. I saw the tough loss prevention action of Gee Bees with searching everyone’s bags. I had not experienced this before at any other store so as a child it was shocking to me. Did it stop us from shopping there? No. While our neighbors went to Century III and Monroeville we still went to Eastland. My first trip to Century III was probably 1982!! I remember being at my grandma’s house in Homestead and could walk to the corner store and get food and groceries and put it on the “tab.” That was 1978. It was another time that suddenly started to change. How about Kennywood being the first amusement park in the United States to install metal detectors. I am not judging anyone. I am simply pointing out what I observed around me when the mill towns die and people move and shop in different neighborhoods. I love the area and Eastland will always be in my heart. I remember seeing Bigfoot there!! Or… the ‘Man In Ice’. Sure it was fake…but to a kid.. It was the most amazing memory!! Not to mention the toys from Bee Gees!! Lots of fond memories fro Eastland. I lived there with my parents, brothers and sisters. Sold it 5 years ago when my mother died. near my daughter. McKeesport will always be my home. Remember Eastland Mall as a child growing up I remember my Aunt Willa taking my sister and myself to one of the stores to buy us hats for the winter this is when the mall was’nt enclosed it had to be late 60’s. We were here visiting from out of state. We moved back to North Versailles (Crestas Terrace) in 1978 and the mall now enclosed was still going strong. So many happy memories of my sisters and I shopping for jeans at the Clothes Bin, Bakers shoe store, national record mart I could go on and on. A lot has changed over the years and I know tell my adult children about Eastland Mall and the great times we had shopping and going to movie theater with my boyfriend who is know my husband. Was very sorry to see it go down, it’s just a empty desolate lot now. But I still have great memories ! Thanks everyone for sharing your precious memories. My siblings and I lived on Maryland Ave. in the 60s. Before going to the Matinee at the Eastland Theatre, we would stop at Sun Drugs to get our candy fixes. Good times, for sure. there was a gift shop upstairs across from Gimbels and they owned the card shop in the lower level as well. My sister, Jeanne, worked there. The owner was a Jewish man but I can’t think of the name of the store – maybe it was Richardson’s . I have a set of frosted glasses and pitcher that my Mom was given as a gift from the shop. 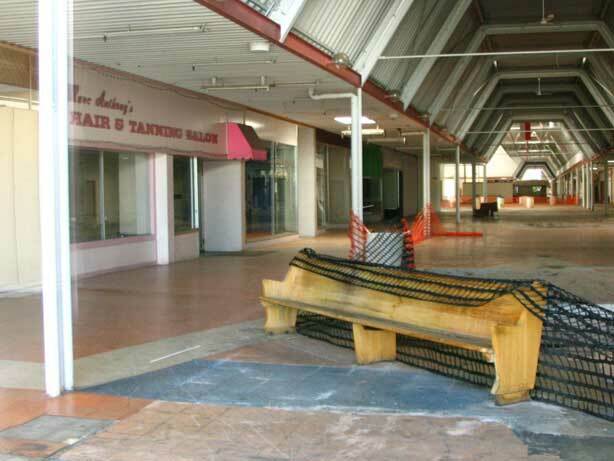 I’ll never forget Eastland Mall. In high school my best friend Sherry Tkocs and I worked at Dunkin Donuts in McKeesport. Every other Friday we’d race off the school bus, change clothes run to Findley’s to catch the PAT bus to Dunkin Donuts to pick up our paycheck. Walk “downtown” McKeesport…. to cash our checks then catch another bus to Eastland Mall. First stop was the Deli on the lower level that made the BEST burgers, corned beef and pastrami sandwichs. After eating we always hit NRM to pick up the newest 45. Go thru almost every store in the Mall before catching 2 busses back home to Grandview. I will FOREVER cherish those days. My best friend, like Eastland Mall, are no longer here. March 8th will be 16 yrs. since she passed at the age of 37. I miss her terribly and think of her always. Eastland Mall will always remind me of her. So many great memories!!!! I worked at Two Brothers Boutique before the shopping Center became enclosed. I lived on the hill directly behind Eastland until 1971. My girlfriends and I would meet friends there and walk around and just hang out when we were in our early teens. My mother, Margie Videc was a waitress for many years at the Sun Drug Pharmacy coffee shop. The restaurant manager was a Katie Vucic. I even put a little bit of other as a dishwasher, helping out. One day, my mother was driving in the parking lot and got broadsided. That was a great story. I have never been to the Eastland Mall myself, but I did read about it a few years ago in the “Post-Gazette” … and I have learned some information about it by going to various sites, which talks about the mall. MY cousin was the one that built the car wash. He sold it before it opened. Remember the pet store in there in the early/mid 90’s? Bought ferrets there. Also the doll shop that sold Robin Woods dolls. She came and signed dolls there. Got my ears pierced at 16 there. Lots of cool memories! My first job ever was running the Christmas train at Eastland. When we were little my Grandmother ant Aunt Loretta would take us to Woolworths for banana splits. I loved picking the balloons and breaking them. The price tag inside was what you paid for the ice cream. I was so excited when I found a 1cent tag. yes it was McSorley’s….My husband’s first job after we were married in 1961 was in the rug department at Gimbels. He then went into selling electronics, which then was televisions, etc. After Gimbels moved to the Monroeville Mall, he transferred there until Gimbels closed and then sold for Kaufmann’s until he passed away. He knew so many customers who came back time and time again to buy new TV’s. My Mom was a manager at Gimbel’s and my first job was a stock boy there. So many memories! Don’t know why these stores haven’t been mentioned…2 Brothers Botique, Father & Son Shoes, Menzies on lower level. Also the Red Carpet Beauty Salon, lower level right outside of Gimbels. Oh and Baker’s Shoes. Ahhh, ya forgot one shoe store. Flagg Brothers. I bought shoes there. If you were young and hip in the 70’s, you bought your shoes at Flagg… and bought your clothes at 2 Brothers. I shopped both. 2 Brothers was owned by Patrick Monahan. My mom went to school with him. There were actually three, 2 Brothers locations. But Flagg Brothers was thee place to go if you wanted, hip and funky shoes. Randy McDaniels, TLC. Bought my first 25 inch console tv and 8 track car radio at wander sales in 1976. Met my good friend gene Magraw there in 1989, he was the dj and announcer for the flea market, when it was in the gimbels store and downstairs. Gene had the dj booth at the bottom of the stairs, I won 2 weeks in a row on the music trivia contest, won a free lunch for two at little nicks diner over the hill towards McKeesport, there’s a speedway gas station they put there now. Wish I could have seen eastland mall when it first opened or even in the 60,s and early 70,s. just glad I was there before they closed it, still wish it was there, at least even as a flea market. Rest in peace to my good friend gene Magraw, who passed away in 2003, even before the place shut down. Also met my ex girlfriend there in 1989, me and sue are not together anymore, but we are still good friends and I still love her, as friends of course, lol. Oh well, I could go on and on about my good memories of eastland and the flea market, but will just have to remember the good times in my memories and pictures. Hi john, I’m genes cousin beth. I have lost touch with most of the family and was wondering if you ever see genes wife dawn? You can email me at bmwgrw1995@aol.com. i would love to hear from you. Hi Beth, this is John Stanton, I knew gene McGraw since 1989. He passed away in 2003, I was there with him when he had a heart attack in his house on wolf ave. I was living there with gene and his wife Donna, everyone called her doe. I was living there with my then fiancé dawn Merritt, did you know her too? Gene,s wife Donna died in 2010 of a heart attack also. I loved them both very much and still miss them both even to this day, they both died too early. I guess it’s true that the good die young. Hi Beth, this is John Stanton again, my email address is Jacktheroofer12@gmail.com, if u email me I will be able to email u back with information on gene McGraw, hope to hear from you, thanks. I remember that fun and joy of the whole crusade. Movies ,weiner world.murphys.gimbells.i watched the place go down hill. My dad daniel worked there for years .god bless him .all good things will come to a end one day. What I remember (and didn’t see mentioned) was probably related to the carnival; a temporary outdoor, above-ground fish tank that looked like a glass swimming pool. It probably had trout or the like but I remembered sharks since the old Pittsburgh Aqua Zoo had that those huge glass windows winding down it’s shark tank. Whether it was Monroeville or Eastland Mall, no one remembered it. There was a quaint Christmas train and display area that, for at least one season, had a worker hidden in the eaves talking to children as a talking tree(?) that could see and hear them. I was gullible and fell for it hook, line, and sinker . . . and loved it! There was almost always something to pique youngsters’ interests. Be it a holiday displays or colorful, fun stores. The beauty salon mentioned, Red Carpet, was actually there a long time before the restructuring. It had the two older female owners in a flashy red office setup always wanting their hair done and smoking. I remember being a teenage boy getting my hair washed from a voluminous stylist whose bosom would nearly suffocate me. Some of the beauticians are still floating around the Burgh at other establishments. Ours is working out of the JC Penney in Monroeville, Lastly, I remember Blanche and the gang in the old library downstairs. I have many other memories about these things and more and I’m so very glad I came across this article to get those memories refreshed. I read it to my family and we had our own mini-discussion panel. Good times . . .
My memories of Eastland are from the late 70’s to mid 80’s. Gimbels was still there, G.C.Murphys down on the end had great models, The best place was go down the esclators to the lower level, turn left and on the left was the video arcade. Heaven. I saw bit and pieces of it after that, it went down hill and that was it. Still great memories. As a kid in the 70s I often went there with my mother. I remember the old RCA tv sets in Wander Sales, across from Gee Bee’s right? I remember having a dinner with my dad’s family cause my uncle had come up from Florida. It was a nice adult restaurant, anyone know the name? Went to the movies there too. Saw it decline during the flea market days. Very bleak and depressing. Jeff, did the restaurant happened to be called McSorley’s? yes, it was. Great crab cakes, and draft beer. Dad would take my Mom and me there on Saturday eves when Mom got off at 9 PM from Cox’s in McKeesport. Back in the 40s, my grandfather (Joe Krsul) strip mined that ground as he had a coal business. There were also mines underground. Don’t know if later they filled the mines or not. Just thought I would share that info. Back in the 40s my grandfather mined that ground. There were mines under it and a strip mine on the top. Don’t know if they filled the mines later or not. Just thought I would throw that out there. Loved that mall! Loved going to the flea market later too! one memery i have about eastland is driving over to eastland in a state of panic. I was headed over to the national record mart to tell my friend, Joy Byers, that the radio was reporting that paul mccatney was dead. there are so many good memeries of the great eastland i could go on for some time. I enjoyed all of the comments: two places weren’t mentioned; Sabin’s China Store and the Computer Store. Yes I remember the snowy says we got back then and driving thru eastland parking lot doing what we called donuts and seeing the over spray of snow, we were so lucky we never hit a light pole.also we were told that Eastland was filled in from slag from the still mills.remember the old car wash, the Goodyear tires building and the bank at the end where I had my first date with a girl in her mid 20s,Nina was her name, never forget the first love. I can remember working my first job as an usher at the movie theater behind Eastland Shopping Center, back then the movie Goldfinger came out, then all I can say is that if I didn’t see it at least 100 times I didn’t see it once, I can still remember all the popcorn I snitched. Great Memories. I took Singer Sewing lessons at the Singer’s store every Saturday in 8th grade (1969 – 1970) on the PAT buses. Many banana splits at Woolworth’s – breaking the balloon to see what kind of a discount I would get. I felt very ‘grown up’ an independent going there on my own. Hi, in late 1969 and early spring 1970 I worked at the toy store next to National Record Mart. It was called Monchauck Bros. and they also sold guns. There was also 2 jewelry stores, a Shop & Save and a fabric store. I got my first credit card ( became a divorced single mom) buying a 14 inch black and white T.V. at Wander sales. Whenever I go past the empty lot even after all these years it still looks weird. I remember eating lunch at Wiener World in the center of the mall with all it’s “earth tone” oranges, greens, and browns. I spent a lot of time there in the 1970’s and early 80’s. I still live in East McKeesport and have unfortunately watched the demise of this once-great shopping mall and social gathering place. I used to work at wiener world. Left my job at KFC(across the street from eastland) for 10 cents more. Learned to make soft serve cones there and learned to appreciate a mayo, pickle topping to my all meat hot dogs. I still remember my bosses name, it was Rose. Working at wiener world helped fund my college education. Does any remember the name of the jewelry store across from Woolworths? I purchased my first cassette at NRM. Ozzy’s Bark at the Moon! We lived on the hill behind Eastland on a street called Westbury Road. The whole site was just woods then. I had my first and last cigarette, New Port Menthol. My friend and neighbor Terry took some from his mother’s purse and we ran down to grab a smoke. HATED IT….Thats why I do not smoke today! When construction started, they leveled all the land. I could not believe how large the earthmovers and huge dump trucks they had. US Steel used the trash and slag dump over the hill behind the theater. That was a deep hillside. I remember old TV’s. We threw rocks at them to implode the picture tubes. VERY COOL! Old Coke and Pepsi machines, trash from the surrounding townships. I found a big knife and took it home……never saw that again! Thanks mom! After it was filled they put some apartments which are still there. Right before they started the Eastland construction after clearing the land, I remember a large circus came onto the site. My dad took me to see it. I watched them set up and tear down from my bedroom window. After that they started the ironwork. I was about 10. All the kids from our street went down on the weekend. The only person was a security guard. His shack was by the theater site. We would sneak down and start climbing the iron beams walking to the sky, never thinking we would fall. He would come and start yelling at us. You know, we got to know him and he was a nice guy. I remember that he had a limp. When the mall opened, I went down with some friends and went into every store. ( could not do that today, your parents would be arrested ) The bakery had free cookies that day and the bank on the lower level was taking Polaroid photos. I still have that! When the winter came it was very cold going store to store since it was an outside mall. Later they placed a cover over the whole unit. Seems like yesterday! Joey, do you remember the time when I hurt my leg on the conveyor belt on Labor Day weekend at McSorley’s? It was 1965 I believe. Yes I do….you broke your arm falling out of the apple tree next to my driveway too..BTY It was your mom’s New Ports!!! My mom worked at Eastland Theater as cashier from 1968 until it doors closed over 20 years later. My children loved going to work with her and watching the same movie over and over. She would always come home from work and tell me who was dating who, and what movie they would see. Eastland Mall was a must for teenagers on Saturdays, you could go to Sun Drugs soda counter and have a burger and coke for less than a buck! Great memories, Green Valley was a great place to grow up. Does anyone remember the carnivals held on the eastland mall parking area? How about the rooms of furniture set up like a home in Wander Sales? I modeled for woolworths and my mom worked at woolworths. She even slammed the fingers of a potential robber in her cash register drawer. Grew up in Green Valley and am still very good friends with my childhood girlfriends. It was a great place to be raised. I remember when they were building Eastland. The gang would ride our bikes up there and do all sorts of stuff. After it opened we would go there on weekends and check out all the stores for the latest. I sold Sunday newspapers there for awhile then moved on to be an usher at the theater. Great times. I have enjoyed reading everyone’s comments. Brought back some cool memories. Frances Saunders Kinner – I also worked at the carwash and yeah, his name is Carl and he owns a store and carwash in Homeville. Brings back old memories. Remember “TWO BROTHERS”? the coolest place to buy jeans and shirts!! Just saw Carmen Candelore, the owner, last week!!! He used to give me “sample” clothes to wear when I was a teenager, and a great family discount!! Remember my first stereo coming from Wander Sales. And I would buy so many records from National Record Mart. And also learning to drive there. And dating a girl named Melanie who worked at Woolworth’s. Seeing wrestling outside of Gimbel’s. My friends & I would walk from East Pittsburgh across the Westinghouse Bridge almost every Saturday until we were old enough to drive. So many great memories. Also, I should point out that Valley Shoe Repair still exists not far from Eastland. “Tony the Shoemaker” is the best cobbler in the world, a cheerful Italian immigrant who longed to move to America since 1945 (you do the math on that one), and still maintains regular work hours out of the Great Valley Shopping Center on Route 30 in North Versailles just up the hill from where Eastland once stood. He does great, great work and can make a favorite pair of shoes that you may feel are kind of worn out into the gems they once were for a very fair price. I’d say “Keep Eastland Alive” and visit him, but really you should visit him because he’s just very good at what he does. I don’t remember the Eastland as anything but being run down, but was always fascinated by it because it was so run down. This fascination led me to do research on the place, and much of the writing you quote in Wikipedia is my own (heels catching on tiles, the 42-year runs of Marc Anthony’s and Valley Shoe Repair, etc.). What I want to complement you on is that of all this research I have done, your two pictures of Gimbles are the only pictures I have ever seen of Eastland Mall in its pre-1986 heyday. Kudos! I was at the grand opening of Eastland Mall. We got free popcorn. It was the talk of the town. Also worked at Thom McCann shoes and Kinney shoes. There was an upscale store called Foxworths that I would DIE to get anything from. It was simple and it was innocent. Wow, those WERE the days. our family did the ribbon ceremony when the mall reopened after the fire. i have a picture but don’t know how post it here!!! I remember the day Eastland opened. I was probably around 12 years old. Great memories of going there on friday nights and just hanging out. My husband started his retail career at Gimbels after getting a job as a stock boy, moved up to sales, then management and then buyer. My Mom worked at the Penney’s store for years. Had friends that worked at Thom Mcan and I worked at TOYCO. It wasn’t too hard back then to get a ride to and from work. I’ve had a few different memories of Eastland, never got to see it back in the day, but I did love it in the 90’s. My family owned the Beer World store, and as a kid I would always be running around there. I was devastated to see it go in 2005. I had lots of great times at Eastland. I still have my Pioneer SX-1980 stereo receiver that I bought in 1980 at Wander Sales at the mall. I also remember interning at WEDO Radio in 1974, and WEDO doing a LIVE broadcast from the mall for its huge Grand Opening. (The mall actually had been open for some time at that point, but WEDO didn’t do the Grand Opening celebration coverage until the spring of 1974). I remember getting my first pair of contact lenses at Pearl Vision at Eastland… and eating a lot of dogs at Weiner World. (One of the girls who worked at Weiner World, her name is Sandy… now works at The Auto Supermarket at Olympia Shopping Center… I just saw her a few weeks ago working there). The worst thing Eastland ever did… was enclose the upper level. It had a coolness when it was wide open. After they enclosed it… it was just CHEE-ZEE. Do you remember the green sidewalks? Hey Jim, great photos and details of Eastland. Brought back great memories of the 60’s and 70’s. My first job was at the Eastland Car Wash. We had fun times working there, even though we almost froze to death. Do you remember Tom and Leroy? Was the owner”s name Carl? I also remember using the parking lot for practicing my driving skills in the winter snow!!! Hello, I also worked at the carwash and yes it was named Carl’s, Carl Singer owned it and the one at Greater Valley shopping center along with a few others. Worked there for about a year and spent many a cold winters night freezing, all we had was that little booth with a little tiny heater but Carl insisted we stand outside so customers would know we were open. I too worked at Eastland Mall. It was at Wander Sales it was appliances and furniture store. The people were great and I have fond memories especially around the Holidays where outside Gimbels they use to have a Gift Wrapping Center and I also worked at the Weiner World for a while. So many happy memories and fun times. The mall maybe gone but the memories are forever. Too bad the next generation will not realize what they are missing. Hey Jim, Thanks for the memories. I remember Eastland (but not as vividly as you do!) well. I bought my mom a color tv with a stereo in a drawer that you pulled out from underneath the tv. Was Magnussen a tv brand? I forget the name of the store too… I made payments on that sucker and she got a big bow on it for Christmas. When I finally moved out at the ripe old age of 22, I took it with me. What an Indian Giver! Loved the article. Brought back great teen memories of the 60’s. I worked at both Baker Shoe’s and Richman Bros. Mens Clothing store during the mid to late 60’s. I had my first ruben sandwich at McSorley’s, spent most Saturdays walking the mall or going to the movie theaters. Great memories. Thank you. Jim I can remember Thom McAn’s and Flagg Brothers Shoes at Eastland Mall. During the car crazed 60’s, Thom McAn’s had cool shoes named after cars or car stuff. “GTO’s” and “Seatbelts” were two that come to mind. My dad and I got into a test of wills over these when I was about 13 or 14. He insisted on the more practical Thom McAn “Roma’s” and I wanted one of the current styles. He wouldn’t give in so we went home empty handed. Mom eventually enlightened dad and I did get a pair of “GTO’s”. My first credit card ever (Gimbels)..Boy did i buy the clothes…I also remember vividly seeing Rocky for the first time at the theater,,,,So sad to see it all go. Movies almost every Saturday by taking the 61C to Mckeesport…60M to Eastland…..seems like forever….also, I can remember, when I was very very young…My sister Shirley buying all of her wedding clothes at Eastland and them getting stolen out of our car while her and Mom were shopping. This really takes me back. Eastland was huge in its day. Loved Gimbels and Penney’s. The place was so festive around the holidays. I also remember using the parking lot as a place to practice driving. Not only was it a place where you could practice driving, one could also practice having their first fender bender!!! i remember eastland soooooo well. it was one of the very first shopping malls – outdoor of course that we ever had. i especially remember going to the movie theater with my mom, my friends, and even on my very first date with a boy. i saw mash, gone with the wind, where were you when the lights went out etc… and many many more great movies there after the movies at night we would leave eastland and drive home quickly to beat our curfew listening to terry lee ‘s music for young lovers, we use to go there all the time!! it was great to shop there for christmas. i will always remember it. Thank you for mentioning the Golden Rule. My dad worked there for 38 years and still has fond memories of his wonderful customers. Exactly Ken, you hit the nail (or the screw) on the head! Gotcha Seth – Thanks for the correction! The first time I ever drove alone after getting my driver’s license was to see the movie Camelot at the theater at Eastland. It snowed while I was in the theater and I was scared to death as I drove back to Braddock. My mom and aunts were always making me take them to Eastland after school. None of them drove. Every year’s school clothes were bought at JC Penny, Eastland was very cool to a young kid. I remember buying a Remington 670 Wingmaster shotgun at JC Penney’s in Eastland Mall when they were doing away with the sporting goods department at the store. I paid $140.00 for that gun. What a deal. I remember, as a kid, going to Gimbels, Penney’s, Wander’s and other stores on frequent trips with my parents and and grandparents. Several times, as young teenagers, my friends and I would walk to the mall from downtown McKeesport via the railroad tracks past the vacant Firth Sterling plant and up the steep hillside. Those were the days. Two J’s bicycle shop! I bought many Schwinn stingray parts there. The bike I bought on the side of the road leading to the mall from Rt.30. Many memories of that place! 1 or 2 from the magistrate…lol.